I’m not known for my house-keeping skills. Truth be told, I will choose pretty much any activity over wiping things which will be covered in dust and mud and Lego moments later. 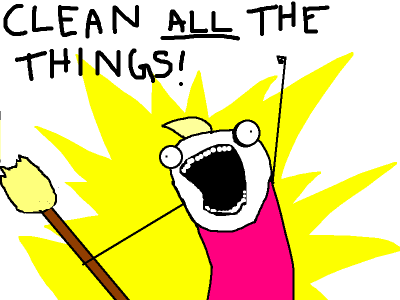 However, every so often (when I’m expecting visitors, oddly enough), I get a strange Urge to Clean. And today is one of those days, people. I’m overly optimistic when the Urge to Clean takes over. I begin by wiping down the skirting boards with a damp cloth, sewing tie-backs for the cheap IKEA curtains and polishing my candlesticks with Brasso, despite the fact that the bin needed emptying sometime in the 1980’s and the bathroom sink is harboring sentient life. The picture – which could so easily be a self portrait right about now – is by the fantastic Hyperbole and a Half and is from one of my favourites This is Why I’ll Never Be an Adult. Do check out her alternative pain chart, too. It’s genius.